Imagine delivering a flawless, broadcast-quality live video message from your executive team, or a live training event, to all of your employees, on any device, wherever they are, without clogging your network bandwidth. Can your corporate network support live events for large audiences without creating a bandwidth bottleneck or crashing? This is something organizations must find solutions for when planning internal live broadcasts to ensure high-quality streaming for no-fail events. Livestream’s new Peer-to-Peer Enterprise Content Delivery Network (eCDN) solves for these issues by supporting an HD-quality seamless live viewing experience while minimizing the stress on your corporate network, reducing bandwidth consumption and cost, and maintaining privacy and security regulations. Livestream’s eCDN for corporate communications empowers IT and communications teams to deliver a flawless streaming video event, without risking network health or compromising critical business functions. An eCDN is an enterprise content delivery network, which is one way for companies to distribute content within their corporate network, creating a safety net for their internal bandwidth pipe. A peer-to-peer eCDN helps to avoid network bottlenecks that occur when a large number of concurrent viewers in one office are watching the same content, such as a live broadcast. Instead of individual employee devices all pinging a single server to access a stream, a P2P eCDN reduces the amount of bandwidth needed coming from the external server. Instead, Livestream’s eCDN uses the bandwidth inside the company, redistributing the requests to devices within the LAN, improving stream quality and reducing the bandwidth load on a company’s internal network. Video is the fastest and easiest way to learn and retain information. Streaming your internal and all hands meetings has become de rigueur at large companies, but these in-demand, data-heavy streams can have massive network implications. Streaming company-wide meetings is an effective way to keep employees engaged. According to the Harvard Business Review, engaged employees report 31% higher productivity and 37% higher sales. Conversely, the Dale Carnegie Institute reports that businesses with disengaged employees lose $11b annually. This engagement data is driving demand for access to video in the workplace: according to Cisco, global business IP traffic is set to grow 21% from 2015 to 2021, which will require updated infrastructure to handle the load. To avoid additional expenses or potential network failures, many corporations are considering eCDNs to meet these new challenges. In a traditional content delivery setup, viewers connect to a server to obtain the streaming video they have requested. This server can either be inside the company or external – an example would be video content cached and delivered from a Cloud provider. Both of these setups have their limitations. If everyone in the company tries to connect to a single server at the headquarters, the connections will quickly become saturated and the server will likely crash as it was not meant to handle thousands of simultaneous requests for data-heavy video. If the server is in the cloud, companies often have significant limitations when it comes to connecting to the internet. They generally have a fixed capacity when it comes to external bandwidth, and networks are often not dimensioned for a massive amount of data requests from outside their network. Firewalls can further delay external calls, creating huge bottlenecks. Solution 1: Install caching servers within the company network at each site. Installing caching servers allows you to place a copy of the video close to your viewers to avoid the congestion of large numbers of requests to a single server. The challenge is this solution requires both significant CAPEX (cash) and OPEX (operating expenses). Servers are expensive, and installing and maintaining them requires significant expertise and dedicated personnel. In addition to regular maintenance, you’ll also need a dedicated IT team at each site to maintain servers to guarantee no-fail live streams. Solution 2: Use an internal multicasting tool. A multicasting tool broadcasts content en masse to every computer on the network. This requires specific equipment that supports multicast, and may also necessitate changing workstation software to be able to support multicast streams. This is not the “typical” streaming setup so it can require additional configuration in addition to this CAPEX. Solution 3: Legacy P2P solutions. Peer-to-peer within company networks has existed for many years. 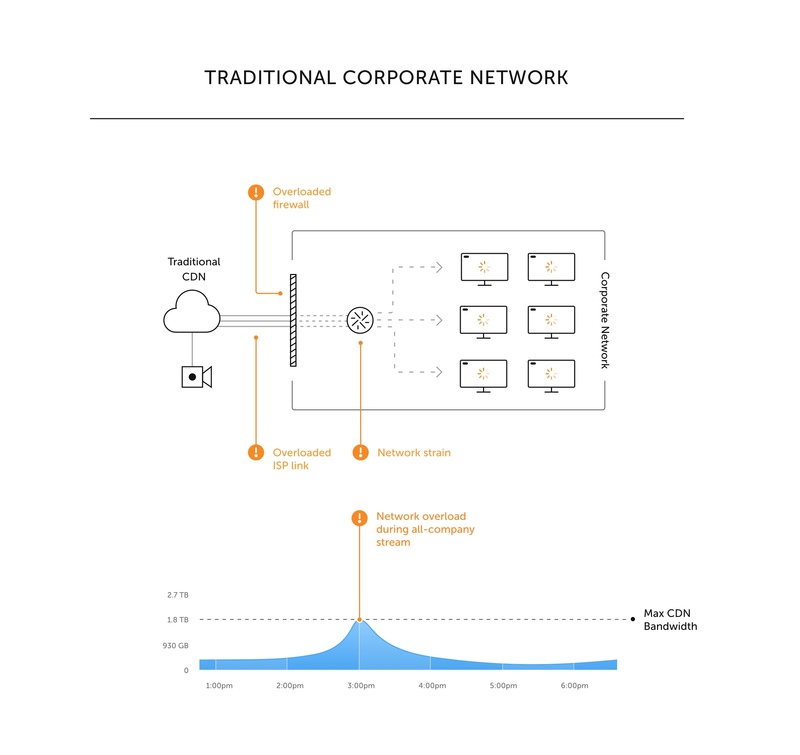 The principle of P2P is to use the abundant bandwidth within the enterprise network. However, the solutions on the market have had several major drawbacks: at the very least they have required users to install a plugin in their browsers or an app. 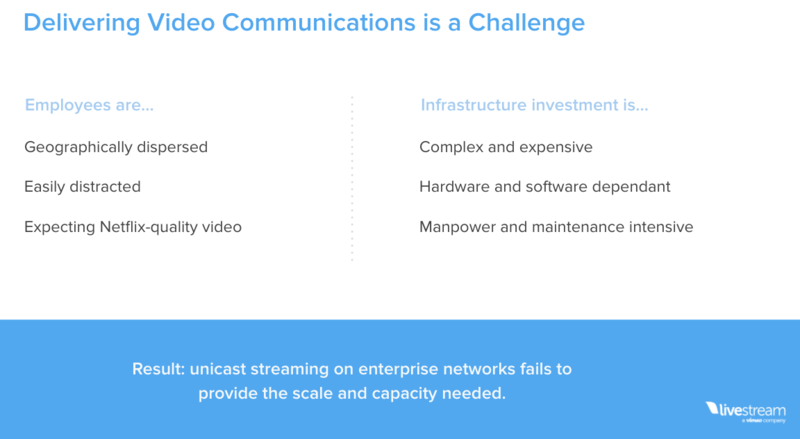 Some providers even require companies to change their entire video stack and use a special, non-standard streaming protocol. 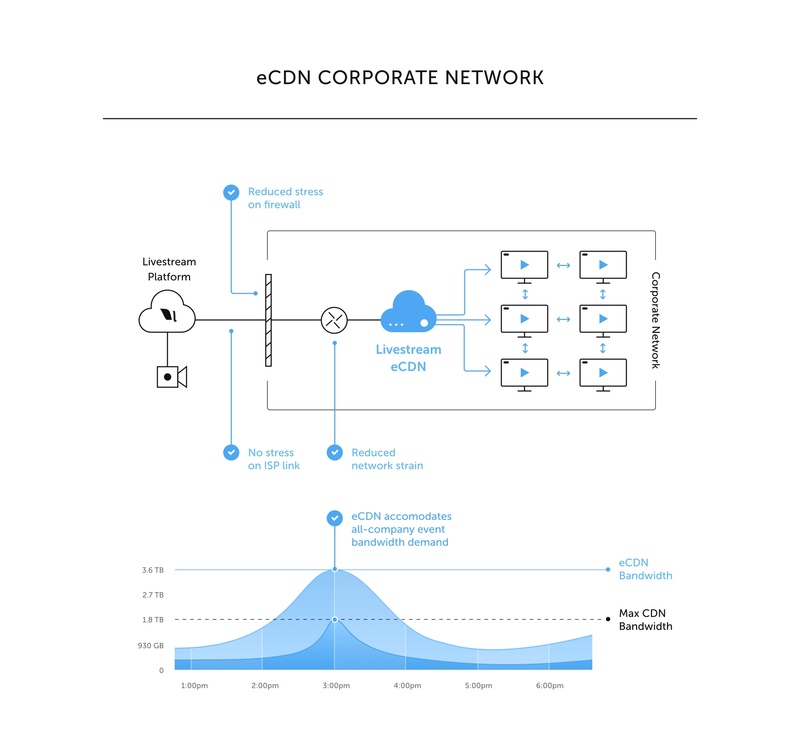 Our eCDN distributes the stream with peer-to-peer networking, harnessing idle internal network bandwidth to more effectively distribute the stream. With Livestream, employees connect to the stream as they would in a typical video streaming setup. However, instead of getting the entire video directly from the server, their video player will also ask for segments of content from nearby co-workers viewing devices. This more efficiently distributes bandwidth requirements within your network, eliminating the risk of bottlenecks to the server, slow connections, and poor video quality. Livestream’s peer-to-peer eCDN shares video across your intranet, utilizing a fraction of the bandwidth necessary from external servers. This allows you to stream high-quality video without interruption, without impacting your bandwidth or internal network. With our cloud-based eCDN, you’re not paying for higher capacity networks or any additional hardware. Using our eCDN does not require viewers to download additional plugins or software. They can still view your streaming video anywhere you would normally display that content. Additionally, since our eCDN is cloud-based, there is no installation cost or time spent. Viewers across the corporate network will experience better video quality and less buffering from using an eCDN. Livestream Enterprise support experts are just a phone call away, any day of the week. Many eCDNs work with desktop plug-ins or costly additional hardware or software. Unlike other peer-based eCDN solutions, Livestream requires no installation on workstations and no changes to your video workflow configuration. We use standard HTTP streaming formats and offer plug-and-play integrations for desktop. Our technology is based on WebRTC, meaning connections are made directly through the browser and there is no workstation software to install, and no browser extensions or plugins for users to manage. Livestream’s eCDN can be activated one time by your account manager and then can be toggled on and off within your Livestream dashboard to use as you see fit. There is no work or downloads required by the end user, and no additional hardware to purchase. How do we set up your eCDN? • First, we test the webRTC connections inside your network. • Your account manager enables eCDN on your Livestream account and tests different devices on the same network. If you have multiple sites, we will test each site. • Finally, Livestream will organize a global test with the company users and a test live video. After this, your eCDN is ready to stream. Want to learn more? Existing Livestream customers can contact their Account Manager, or visit this page and complete a Custom request form.